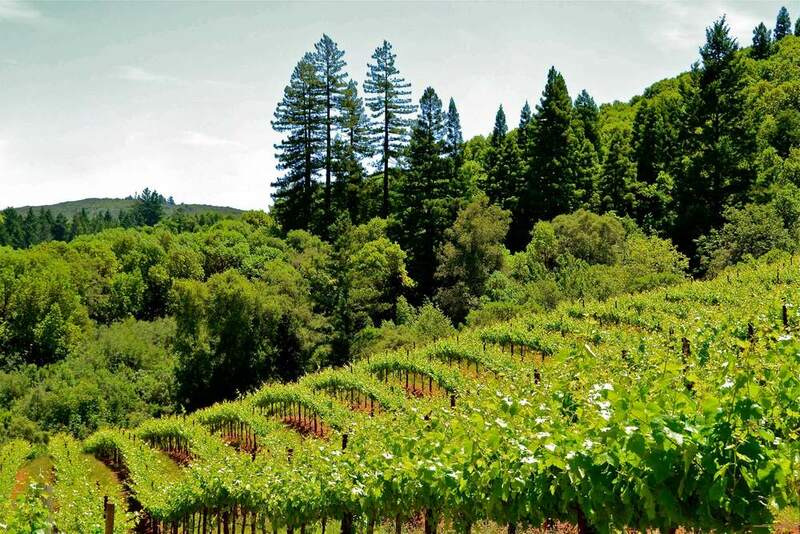 We farm 20 acres in the northwest corner of Dry Creek Valley at elevations exceeding 1,000 feet. These steep vineyards of rocky, clay soil produce mountain fruit with great color, character and intensity. Exactly what winemakers love to craft distinctive, hillside estate wines. Our vineyards also sit above the fog line. So while morning fog cools the valley floor, our hillside fruit enjoys plenty of sunshine. And during the warmer parts of the day, these southeast facing vineyards get early shade, creating an ideal temperature balance for our grapes — lots of sun to develop ripe flavors and varietal characteristics, and cooler periods to help the fruit achieve balance and complexity. Sustainability at Collier Falls involves the integrated management of land, water, vegetation, animals and insects. We seek exceptional quality in our fruit, and feel a responsibility to preserve our part of the ecosystem for future generations of Sonoma County winegrowers. Erosion control - Hillside farming has its challenges. All vineyard blocks are terraced to reduce the impact of erosion. Underground drainage, catch basins and silt ponds collect soil and water run-off, protecting the ecosystem of the natural streams and ponds surrounding our property. Natural pest control - We maintain a completely pesticide free environment. Owl boxes in our vineyards provide homes for native Barn Owls, while Douglas-fir and Redwood trees on our surrounding hillsides serve as raptor perches for hawks and falcons. These birds help control the populations of gophers and voles in the vineyard. We also release ladybugs to combat the detrimental spider mite. Conservation and irrigation - A natural underground well is our water source, and the installation of a drip irrigation system allows us to minimize water usage in the vineyard. We can also add beneficial organic elements like potassium, calcium and nitrogen to the drip irrigation system. This ensures the soil and vines get specifically tailored supplements to maintain a healthy and balanced growing environment. Leaf pulling - Removing leaves around the grape clusters improves air circulation throughout the vine canopy, which reduces the risk of bunch rot and allows us to farm without spraying fungicides on the vines. Leaf pulling also helps to reduce the numbers of leafhoppers and mites that may be present. Cover crops - We plant two different types of native grasses (Zorro Fescue and Blando Brome) to stabilize the soil, reduce erosion, and reduce dust and spider mites in the vineyards. We also plant Crimson Clover which attracts beneficial insects and acts as a green manure by adding nitrogen to the soil. Organic fertilizers - We add a mixture of manure, grape pomace and compost to our vineyard soil to improve soil quality and structure, and to increase the levels of beneficial microorganisms.